Recently I’ve been playing with ink and wood in order to create some interesting end grain relief prints on paper. I’m still working on the method required to get definition between the yearly growth rings. The results can be quite striking. 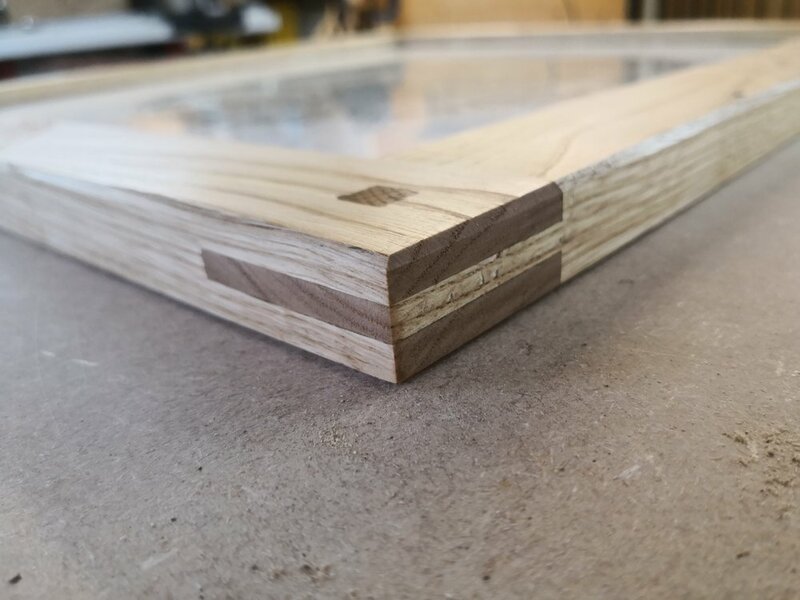 I made a frame for one of the Sweet Chestnut prints using Sweet Chestnut timber! Bridle joints with brown Oak dowels hold the whole thing together. Milled this oak stem in Chobham, some really nice quarter sawn boards at 2x6 and 1x6 with some 3x3 posts. I milled this oak log in Gatwick in the summer on a beautiful sunny day. It was absolutely riddled with nails, screws and fencing so the bottom metre had to be cut off completely and the rest carefully examined before each cut. Despite the large amount of blue staining I was lucky enough not to hit anything at all. I cut two slabs for the top of the table then some 5x5 and 4x4 for the frame underneath. On this table it was decided that I could spend an extra day on the table and plane and size all the timber. This really makes a big difference to the finish of the table and allows the grain to show through. As it dries out and ages the grey of the oak will be enlightened with the silvery medullary rays and will look really smart. As I had planed the timber I also added more finishing touches such as chamfered edges. I built the two ends in the work shop and then completed the rest of it on site. This included cleaning up and hand planing the top smooth. The finished product. One very heavy table! Deodar Cedar is becoming one of my favourite timbers to mill! It is one of the best smelling timbers around and it doesn't seem to fade even after it is seasoned. This tree had previously had some very harsh pruning on it and was a bit of an eyesore. The client decided to have it taken down but wanted to make use of the nice straight stem. After cutting the top slice it was decided that it was far to good to use for structural material. Instead, it was decided to mill it up with the intention of turning it into a large dining table or two! We persevered and milled it anyway with the intention of possibly using one of the boards to make a coffee table. I picked the best one out and stored it until it was dry enough to use. I then flattened the board and the extent of the rot was pretty bad. However, it also had some really pretty grain patterns and colours in it. Sanded down and polished the grain really started to pop. Nothing particularly technical with this - Just a pretty board with metal legs bolted to it. Its always a shame when a big oak tree succumbs to stormy weather. Especially when they were as nice as this one. The first 6 meters of the trunk were perfectly straight and there were no large knots in it. After that there was a large curved section. I discussed what it could be used for with the client and it just so happened that the tree fell right towards a small river which they had intended to build a bridge over. Shipwrights of the past used to treasure natural curves in oak as they are much stronger than ones that are cut from straight grained timber. So it was decided to make use of the curved part to make two sides of a footbridge. After milling the curved bit in half I then went on to cut 2 inch planks out of the first straight section of the trunk. These were for the treads of the bridge. I also cut some 3 inch planks which were sawn again to make 3x3 for the structural parts of the bridge. The gardeners did a brilliant job of clearing the area and then setting two concrete pads for the bridge to sit on. The hand rails and treads were then cut in and attached. It was a really nice job to follow from start to finish and I'm pretty happy with it. Its all made out of solid Oak so I'd imagine it will last the foreseeable future! Over the past few months I've been working on this observation/high tower/cabin on stilts. All the wood has been milled by either myself or my good friend Matthew from Plumpton College. The 4 main 5x5 legs are cut from a single Oak log, the rest of the frame work is Sweet Chestnut. Both of these timbers are very structurally strong and also very resistant to decay. The 4 legs are also sat on chestnut feet which can be replaced if they start to rot. At some point during the summer we plan to jack the legs up and put small concrete pads under them. The roof and floor are both made from inch thick Western Hemlock boards. The roof then has a plastic membrane and then felt on top of it which makes for a very waterproof roof! The fascias are all Western Red cedar which is an ideal timber to use for things that are always exposed to the elements. The sides of the cabin were covered with a breathable membrane and then cladded with 8x1 Western Red Cedar boards. Its a lovely timber to work with and smells great when you cut it. It's really starting to come together now, just the front and one side left to clad then its onto the windows which we are planning to make out of oak 2x3 with polycarbonate windows.